– 1954, President Dwight D. Eisenhower, Veterans Day proclamation. On the 11th hour, of the 11th day, of the 11th month of 1918, bugle calls signaled the ‘cease fire’ ending the First World War. (The official Armistice was signed earlier that morning.) To those who endured it, WWI was the “Great War”, “the War to End All Wars.” Tragically, an even greater conflict consumed the world just two decades later. Today, 99 years after the end of WWI, Americans mark the anniversary of the WWI Armistice as “Veterans Day”. In Canada it is known as Remembrance Day. On this solemn occasion we honor all those who have served in the military in times of war and peace. 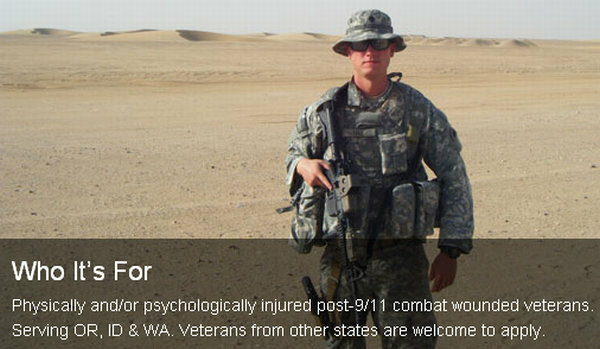 On Veterans Day we especially need to remember the seriously wounded combat veterans. 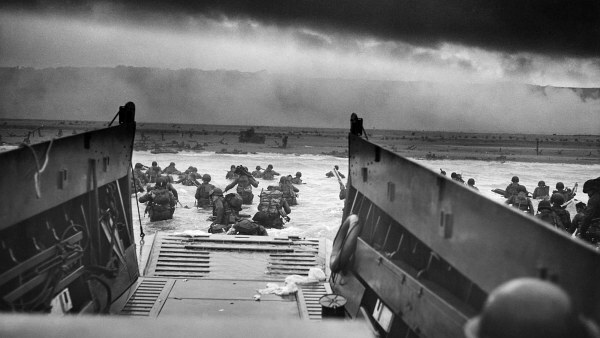 These men and women summon great courage every day to overcome the lasting injuries they suffered in battle. Some of these soldiers have lost limbs, yet volunteered to return to combat duty. That is dedication beyond measure. 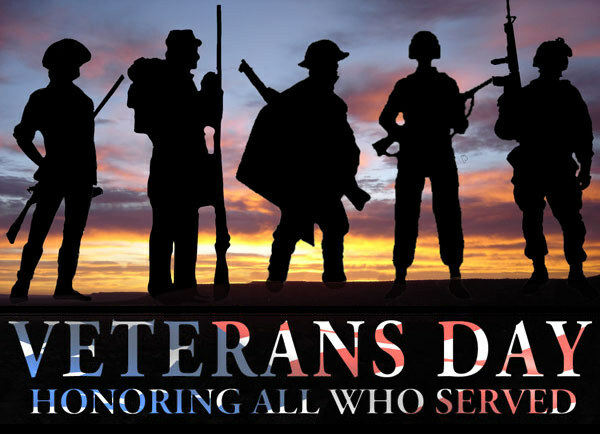 CLICK HERE for List of Regional Veterans Day Ceremonies. 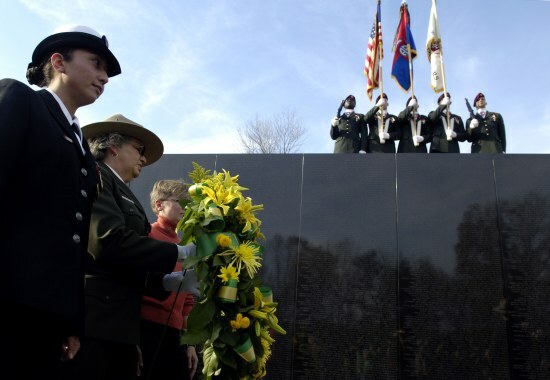 The Veterans Day National Ceremony is held each year on November 11th at Arlington National Cemetery. The ceremony commences precisely at 11:00 a.m. with a wreath laying at the Tomb of the Unknowns and continues inside the Memorial Amphitheater with a parade of colors by veterans’ organizations. The ceremony is intended to honor and thank all who served in the U.S. Armed Forces. Major regional ceremonies and events are also held throughout the country. 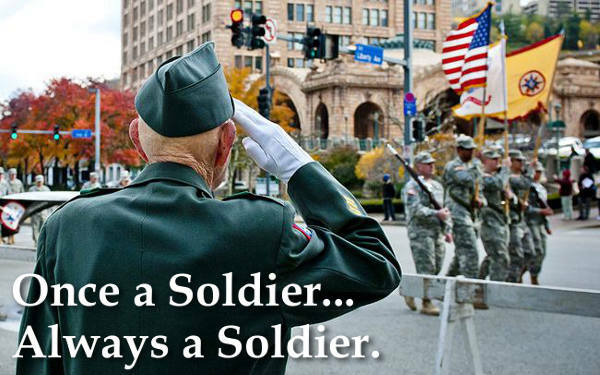 Share the post "Veterans Day — November 11th — Honor All Who Served"
For combat veterans there is a great divide between life pre-war and life post-war. Soldiers prepare, train and are equipped to go to a war zone, but, upon returning home, physically and psychologically injured veterans struggle to assimilate back into a normal life. 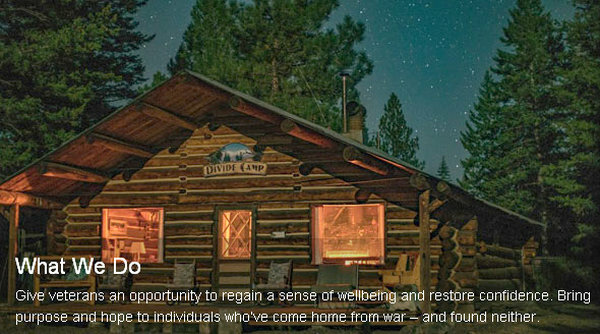 Divide Camp, located in northeastern Oregon, honors the service of post 9-11 combat veterans through small-group outdoor adventures. The non-profit camp offers hunting, fishing, and other recreational activities. Learn More HERE. 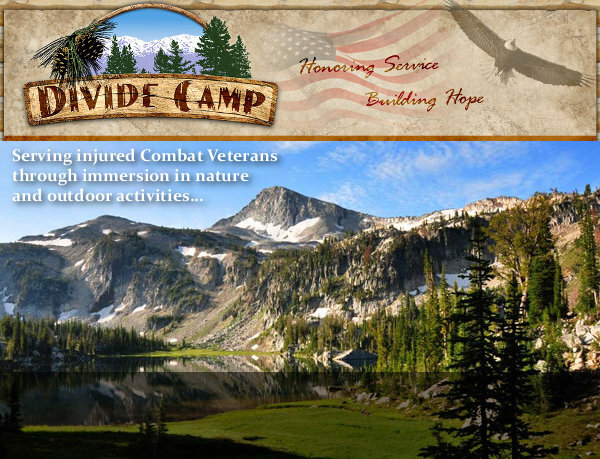 Divide Camp provides lodging, home-cooked meals and transportation at no charge to the veterans served. The camp features 40 acres of remote forestland, six cabins, a shop and an outdoor picnic shelter. 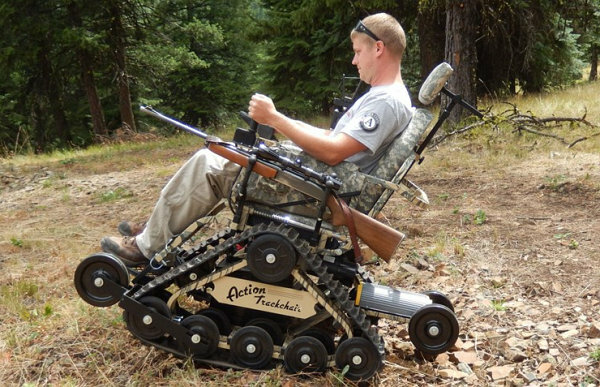 In 2014, The NRA Foundation funded its first grant to Divide Camp — $15,000 for an Action Trackchair — to allow amputee veterans to traverse the mountain terrain. Another grant in 2015 funded pistol range construction, safety gear and targets. Initial range work for a competition 3-D archery course shootable from a Trackchair began with funding from an NRA Foundation grant in 2016. Army veteran Jose Martinez stepped on an improvised explosive device in Afghanistan. Following numerous surgeries and months of therapy, Jose was fitted with prosthetics, which allowed him to walk. Still, extreme depression set in and two suicide attempts followed. On his first day at Divide Camp, Jose used the new all-terrain wheelchair to hunt. “I missed the first couple of times, but my friends didn’t give up on me and Divide Camp didn’t give up on me, and I got one the next morning,” Jose said. “Elk hunting was one of the best experiences I’ve ever had. How many amputees in California can say they shot an elk?” Jose stayed in a new cabin built to accommodate veterans with disabilities. Share the post "Oregon Wilderness Camp Serves Recent Combat Veterans"
Not so long ago, .22 LR Rimfire ammunition was in very short supply. And when you could find decent .22 LR ammo, it was very expensive. High demand and reduced supply lead to high prices. Hoarding by some rimfire shooters didn’t help the situation either. But, thankfully, those days are behind us. Major brand .22 LR rimfire ammunition is now widely available again at reasonable prices. This is good news for all shooters, especially for rimfire competitors and clubs that run youth training programs. Here are some of the best deals we’ve found this week. NOTE: Some of the deals expire soon — if you see something you want, don’t delay. This 36gr Winchester .22 LR ammo would make a nice gift item. The 50-round packs come with a nice slide-top wooden box. For $29.99 you get ten (10) 50-count boxes that fit inside the wood Display Box. That works out to just six cents ($0.06) per round. NOTE: Photo shows a full case in large cardboard box. 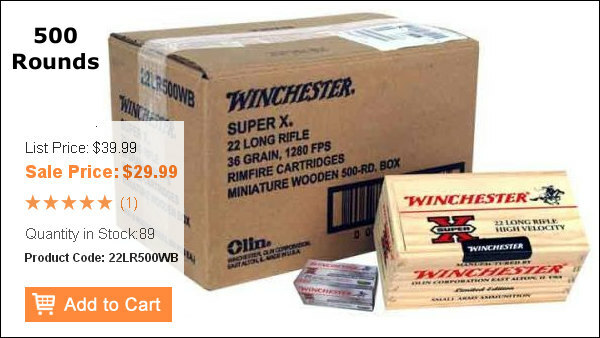 Outdoor Limited’s $29.99 price is for 500 rounds (ten 50-ct boxes) with wooden Winchester case. The “good old days” are back. You can now buy 400 rounds of Big Name, American-made .22 LR Rimfire ammo for under twenty bucks. That’s just five cents ($0.05) per round. 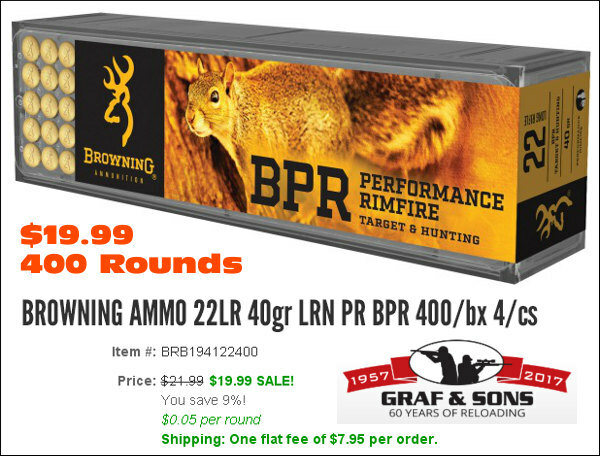 Right now Grafs.com is offering Browning Performance Rimfire (BPR) 40gr LRN rimfire ammo for just $19.99. This is one plastic container with 400 rounds. That works out to just five cents ($0.05 per round). Send 100 rounds down range for the price of a Big Mac at McDonalds. 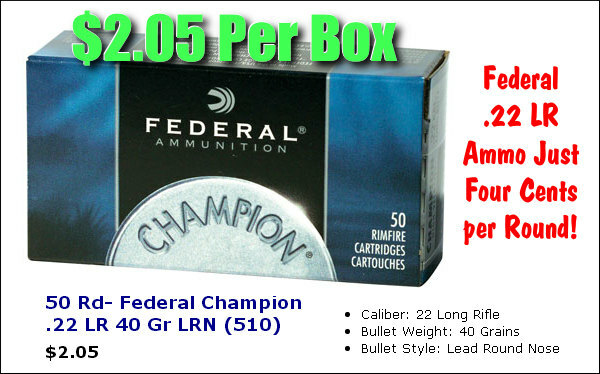 To be honest, we couldn’t believe the price on this Federl 40gr LRN Champion Ammo. Just $2.05 for a 50-round box of name-brand, USA-made ammo. That can’t be right — just four cents ($0.04) per round? Well we called the vendor, AmmoMenLLC.com and confirmed this price is real. Grab it while you can. This is one of the best deals we’ve seen in a long time. 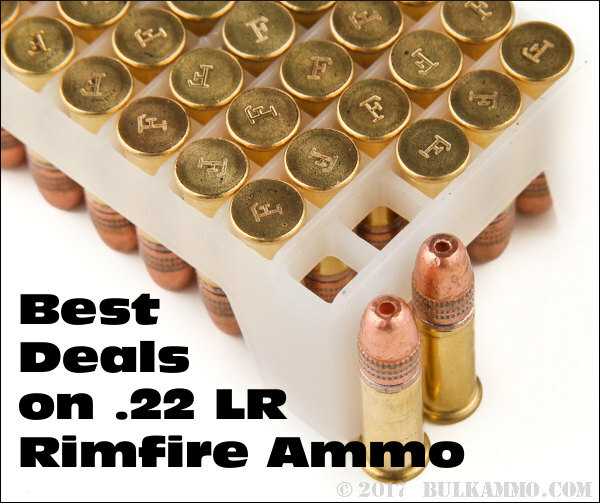 Share the post "Bargains, Bargains, Bargains — Rimfire Ammo Deals"